It was in the spring of 1994 when Guy hit the golf course with Canadiens teammates Patrick Roy and Vincent Damphousse. Three days before, the Bruins eliminated the reigning Stanley Cup champions in seven games in the first round of the playoffs. Also on the Rosemere golf course was Normand Leveille, a photographer with Le Journal de Montreal, taking photos at a distance with a powerful telephoto lens. Guy asked Leveille to stop. Leveille didn't. Finally, Guy had had enough. The next morning, a photo ran on the front page of the paper: Roy and Damphousse on either side of Guy, whose middle finger was raised. The gesture was seen as Guy giving his middle finger to Montreal fans. He assured the public that it had nothing to do with them and he merely wanted his privacy. In the end, he issued an apology. 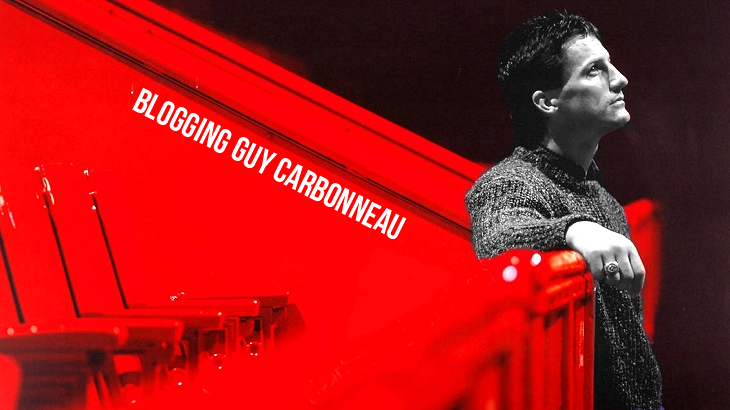 It was certainly not a shining moment in the life of Guy Carbonneau. So it surprised me when I discovered recently in an old article that Carbo has this photo in his personal archives. Surely he'd wish to forget that it ever happened -- after all, the end result was his trade to St. Louis for the unknown Jim Montgomery. "Carbo wasn't a superstar. But he was the real thing. Tough, stubborn, proud, capable of speaking his mind." The next year, the Canadiens missed the playoffs for the first time in 25 years. * Doigt d'honneur is the French term for the middle finger. I have personally never seen the photo, though I once sent a Montreal friend (hi, Kathy!) on a wild goose chase in the library's microfilm archive to find it.